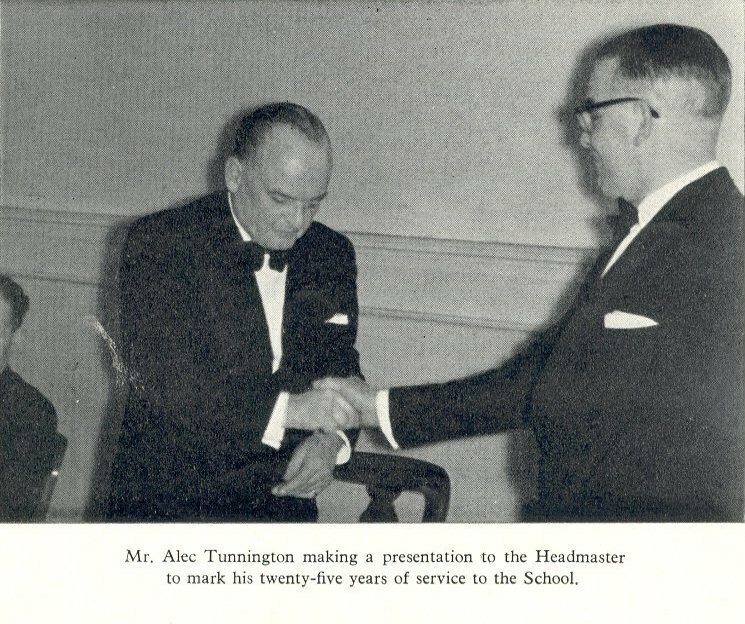 "It was with a sense of pride and gratitude that the Old Boys' Association presented the Headmaster with an inscribed silver bon-bon dish at the 1960 Annual Dinner, which was held at the School. Mr. Alec Tunnington, who made the presentation, paid tribute to Mr. Edward's loyal and devoted service to the School. By the warmth of their acclamation the 120 Old Boys present endorsed the Chairman's remarks. Other speakers were Mr. George Bean, O.B.E., Mr. T. W. Slade, and Dr. W. Melrose." 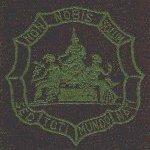 MR. J.R. EDWARDS (Manchester G.S., 1916, Linton Scholar) died on 8 January 1992 at the age of 95. Liverpool Institute, a position that he held until his retirement twenty-six years later. As far as "Jack" Edwards was concerned, the only objective that could be entertained by anyone with serious academic pretensions was to read Classics at Univ. For those unfortunates denied this, reading another subject at Univ. or Classics at another college were just acceptable. Interestingly and against expectation in his later years when the drift away from school classics became too strong to resist, he liberalised his view of academic respectability. He was a stern and authoritarian figure of enormous presence and immaculate appearance, who dominated his school. Seldom seen without his gown, he had only to glare from the window of his study to reduce the lower yard - a paved area that during lunch hours and the mid-morning break was a seething mass of three to four hundred yelling and rushing small boys of the lower school - to silence and decorum. Even then it was an impressive performance; today it is unthinkable. Edwards' driving passions were his school and the classics. He had a genuine love and feeling for Latin and Greek literature. He seemed to enjoy the couple of periods a week that he made available to read texts with the classical sixth forms. The enjoyment was not always shared by those who were taught, however, for whom these were nerve racking occasions; it was never possible to predict whether a blunder in translation would be met with patient and illuminating explanation or with devastating castigation. Some of his insights were quite brilliant and he could teach very well. 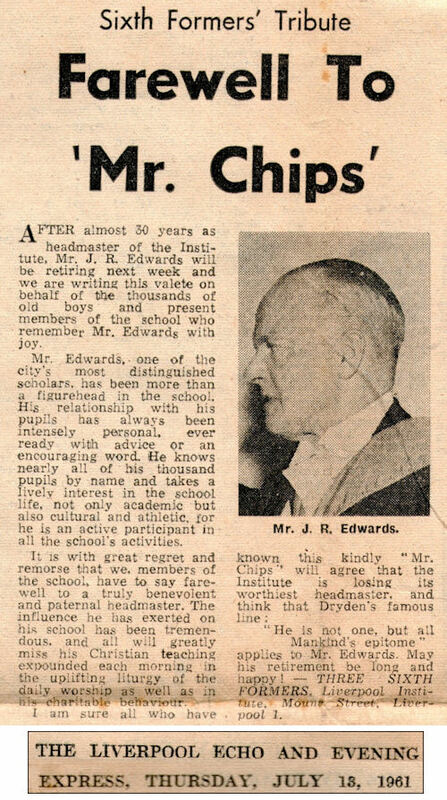 During Edwards' Headship the Liverpool Institute became firmly established as one of the country's leading dozen or so old city grammar schools distinguished for both its academic excellence and the diversity of its extra-curricular activities. Situated in the heart of the city next to the Giles Gilbert Scott cathedral for which it was the choir school, the Institute occupied venerable but run-down buildings on the edge of a rather insalubrious part of town. It served as the local school for its own area but also had the strength of drawing pupils from the whole of the city, and for that reason was a socially heterogeneous and extraordinarily vital society with a strong school spirit to which few would have admitted. Edwards assembled a staff as diverse as the pupils and for the most part they gave the impression of being equally in awe of him. They nevertheless managed to drive and cajole their pupils into distinguished School Certificate and GCE results along with six to ten open awards each year - indeed there was one memorable year when ten of the eleven members of the upper mathematical sixth form won Oxford or Cambridge awards. The words 'public service' were never far from Edwards' lips. For the staff this meant giving up evenings, weekends and time in the school holidays for coaching games, running the scout troop, singing, music, drama, debating, mountaineering and dozens of other activities; there was even a Transport Society, largely devoted to trams. For the pupils it meant long journeys home from the city centre in the evening hours after normal work had finished with no remission on homework, and for Edwards it meant attending many of these occasions himself. Edwards was a Head who was respected rather than liked. He suffered from gout and that must have made life very hard at times. He knew his pupils and could write about them well but he could rarely unbend with them. He built a remarkable school that produced leaders in many professions from bishops to broadcasters to Beatles to barristers. It must have broken his heart in retirement to see his school tom apart and finally closed as a result of political doctrinaire antics on Liverpool City Council."